I have trees very much like these that a girlfriend gave me a long time ago ~ I put them out every Christmas and I just love them. Last year when the people from YANKEE MAGAZINE came to photograph my house (decorated for Christmas) they commented on how much they loved these trees too ~ that's when I vowed to find them for the Girlfriends and put them in this year's webstore . . . and I did! Here they are. Totally handmade, cut from heavy white cardstock and sewn in the USA, each set comes with three trees, small, medium, and large: the biggest is about 9.5", next is 8", and the smallest is 6.25". 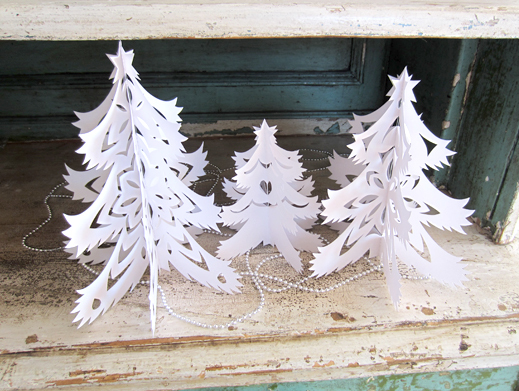 They lay flat to mail and store; bring them out every year, just fold out the sections of the trees to display. Enjoy! $42.95 for the set. Handmade in the USA by our friend Rayan.